Your choice to dine at Standing Stone rewards you with excellent food and craft beer that sustains our farming operation, benefits local producers, helps create a healthier community, builds demand for organic and sustainably grown ingredients, and supports more than 50 employees and their families, and numerous vendors we’re proud to work with! We make it a priority to support regional producers and sustainable, humane farming, livestock production and fishing methods, helping our environment and local economy, and bringing you the best in quality, taste and health. Over 85 percent of the grains we use in our beers are organic or sourced locally from the Klamath Basin and Rogue Valley. 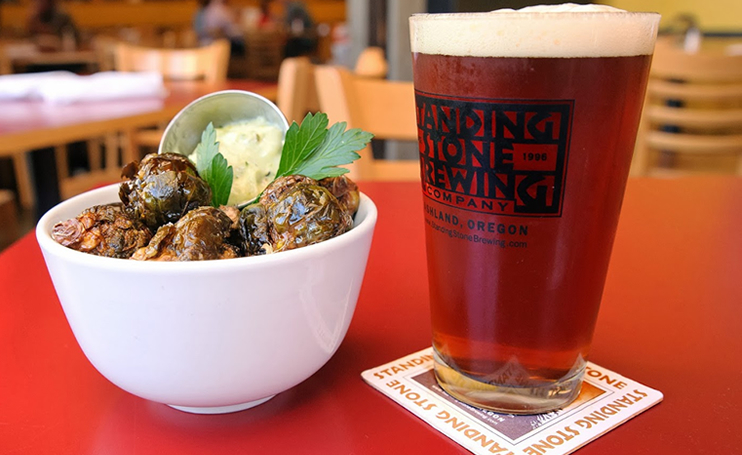 Regional ingredients are a staple in many beers, especially our 100 percent locally sourced I ❤ Oregon Ale. Brewmaster Scott Saulsbury actively seeks local and regional ingredients for our specialty and seasonal beers. We purchase a portion of local, organic hops when they’re in season, from Alpha Beta Hops Farm in Ashland, OR and from 5 Aces Hopyard in the Applegate Valley, OR. Our coffee is organic, equitably traded and locally roasted, from Case Coffee, just around the corner. Our beef comes from our own free-range cattle, raised on our farm just one mile from our restaurant. The cattle are exclusively grass-fed on chemical-free pasture and don’t receive any hormones or antibiotics, making for the most healthful, full-flavored meat. They graze freely in a rotational system, rejuvenating the land. We’re proud to share this delicious, responsibly produced beef. We purchase local, organic and sustainable produce as much as possible. Our chef loves visiting the Growers’ Market to find fresh, new offerings to please your palate. Check out our menu and our specials board to tap into the goodness!